Introibo Ad Altare Dei: "Invalidists"
"Fr." John Hunwicke operates a blog called "Mutual Enrichment" (http://liturgicalnotes.blogspot.com/). An Anglican heretic, Hunwicke joined the Vatican II sect and was "ordained" a "priest" in 2012. A reader brought my attention to his post entitled "Invalidists" which may be read at: http://liturgicalnotes.blogspot.com/2019/02/invalidists.html?m=1. Mr. Hunwicke informs his readers that he will not enable comments which claim "that PF ["Pope" Francis] is not (or might not be) the true Bishop of Rome." Translation: Sedevacantism, the Catholic teaching that a heretic can neither attain to (or remain) pope, is forbidden. Not satisfied with trashing authentic Catholic teaching, he goes on to state,"For similar reasons, I do not enable comments which say, suggest or imply that the Orders of the post-Conciliar Latin Church are not (or might not be) valid." Considering he was "ordained" in the post-V2 rite, such a comment would (correctly) impugn his own alleged priesthood. Hunwicke tells us, "But I have an additional personal reason for not enabling 'invalidist' comments. Only three or four weeks ago, I published a series "Are they really bishops?" in which I discussed this subject in case such discussion might be helpful to people who had been unsettled by Invalidists. I deployed a lot of facts. On the basis of these facts, I asked lots of questions. I have never received, from these lofty and omniscient individuals, any suggested answers to any of my questions." His series of posts (three) are from 12/31/18, 1/3/19, and 1/4/19. This post will respond to Mr. Hunwicke's challenge, with the proviso that I'm neither lofty nor omniscient, just down-to-earth and logical. The preliminary logical question to be put to those who find themselves tempted by Sedevacantism is: "You claim to hold the basic Catholic dogmas that the Church is indefectible; and that the Bishop of Rome holds a unique and God-given place within the life of that Church. How many more decades does the Roman See have to be vacant before these combined doctrines become impossible for sedevacantists to hold? Second, according to theologian Salaverri, instead of being a "primary foundation… without which the Church could not exist," the pope is a "secondary foundation," "ministerial," who exercises his power as someone else’s (Christ’s) representative. (See De Ecclesia 1:448). The great schism of the West suggests to me a reflection which I take the liberty of expressing here. If this schism had not occurred, the hypothesis of such a thing happening would appear to many chimerical. They would say it could not be; God would not permit the Church to come into so unhappy a situation. Heresies might spring up and spread and last painfully long, through the fault and to the perdition of their authors and abettors, to the great distress too of the faithful, increased by actual persecution in many places where the heretics were dominant. But that the true Church should remain between thirty and forty years without a thoroughly ascertained Head, and representative of Christ on earth, this would not be. Yet it has been; and we have no guarantee that it will not be again, though we may fervently hope otherwise. What I would infer is, that we must not be too ready to pronounce on what God may permit. We know with absolute certainty that He will fulfill His promises; not allow anything to occur at variance with them; that He will sustain His Church and enable her to triumph over all enemies and difficulties; that He will give to each of the faithful those graces which are needed for each one’s service of Him and attainment of salvation, as He did during the great schism we have been considering, and in all the sufferings and trials which the Church has passed through from the beginning. We may also trust He will do a great deal more than what He has bound Himself to by His promises. We may look forward with a cheering probability to exemption for the future from some of the troubles and misfortunes that have befallen in the past. But we, or our successors in future generations of Christians, shall perhaps see stranger evils than have yet been experienced, even before the immediate approach of that great winding up of all things on earth that will precede the day of judgment. I am not setting up for a prophet, nor pretending to see unhappy wonders, of which I have no knowledge whatever. All I mean to convey is that contingencies regarding the Church, not excluded by the Divine promises, cannot be regarded as practically impossible, just because they would be terrible and distressing in a very high degree." (See The Relations of the Church to Society — Theological Essays pg. 287; Emphasis mine). Therefore, Indefectibility and a very long interregnum are by no means incompatible as Hunwicke thinks. The teaching of the theologians clearly shows a vacancy of the Holy See lasting for an extended period of time. Such a vacancy cannot be pronounced to be incompatible with the promises of Christ as to the Indefectibility of the Church. It is also taught by the theologians that it would be exceedingly rash to set any prejudged limits as to what God will be prepared to allow to happen to the Holy See, except for that which would be contrary to Divine Law (such as an "heretical pope"--an oxymoron). It is suggested that the 'form' used in the post-Vatican II rites for the consecration of a Bishop (which is what I am going to concentrate upon) is insufficiently precise. But any language, and any specialised (sic) subform of any language, has its own internal logic. If the Church, in the new rites, in effect says "We decree that the words spiritus principalis or pneuma hegemonikon hereafter and herein are to have the meaning of episkope", then that is the meaning those words do have, even if they didn't have it beforehand. Just as legislatures enacting legislation, or solicitors composing legal agreements, commonly begin by defining terms ("within this Act/Agreement, the term The Society shall be deemed to mean the United Society of Water Diviners and Weak Beer Drinkers of the Parish of Little Snottingham in the Parliamentary Constituency of West Barsetshire"). Pope Pius also decreed in that same Constitution: "...that the matter, and the only matter, of the Sacred Orders of the Diaconate, the Priesthood, and the Episcopacy is the imposition of hands; and that the form, and the only form, is the words which determine the application of this matter, which univocally signify the sacramental effects – namely the power of Order and the grace of the Holy Ghost – and which are accepted and used by the Church in that sense." Therefore, to be valid, the form (necessary words) of Holy Orders must (a) invoke the grace of the Holy Ghost, and unambiguously determine (b) the rank of order conferred (deacon, priest, or bishop). In the Traditional Rite this is done. "The fullness of Thy ministry" when spoken to a priest being consecrated can only mean the order of bishop. The "Heavenly anointing" signifies the grace of the Holy Ghost. The new Rite changes the form to "Et nunc effunde super hunc Electum eam virtutem, quae a te est, Spiritum principalem, quem dedisti dilecto Filio Tuo Jesu Christo, quem Ipse donavit sanctis Apostolis, qui constituerunt Ecclesiam per singula loca, ut sanctuarium tuum, in gloriam et laudem indeficientem nominis tui." In English this translates as, "So now pour out upon this chosen one that power which is from Thee, the governing Spirit whom Thou gave to Thy beloved Son, Jesus Christ, the Spirit given by him to the holy apostles, who founded the Church in every place to be Thy temple for the unceasing glory and praise of Thy name." Where is the order of bishop univocally signified? The term "governing Spirit" is subject to many different meanings, and therefore it is ambiguous. (For an excellent synopsis of this problem see the work of Fr. Anthony Cekada, "Why The New Bishops Are Not True Bishops" at http://www.traditionalmass.org/images/articles/NotTruBps1.pdf). There are two problems with Hunwicke's defense. There was no official decree (assuming, ad arguendo, Montini was a valid pope) declaring that the "governing Spirit" means the office of bishop. Second, his analogy to legal documents fails. He seems to think that civil law, or in this case the Church, can make any words mean whatever She wants them to mean. Imagine if in my legal practice I refer to the plaintiff not as "the plaintiff" but "the idiot who annoys me." While the latter may be more accurate in certain cases, it is unprofessional, insulting, and a lack of proper nomenclature. But can't the Church determine Her nomenclature? If She could disregard millennia of accepted usage, the "Hail Mary" could be rendered as "Glorify Satan." If this makes you uncomfortable, it should. Third, if I once more concede, ad arguendo, that "governing Spirit" means the order of bishop, where is the grace of the Holy Ghost mentioned? The fact that "Spirit" is capitalized could mean that "governing Spirit" is a reference to the Holy Ghost, but then it couldn't mean the office of bishop as well. One phrase meaning two distinct things is hardly "univocal" or "unambiguous." It is this ridiculous idea that "words don't matter" that lead to the debacle of Ratzinger and Wojtyla declaring as valid a "mass" that contains no Words of Consecration. In 2001, the Modernist Vatican issued Guidelines For Admission to the Eucharist between the Chaldean Church and the Assyrian Church of the East (2001). It allows for "intercommunion" between members of an Eastern Rite of Vatican II sect and Nestorian heretics. The heretics have no Words of Consecration (or "Institution Narrative" as the Vatican II sect calls it). Yet it is a valid "mass" without any mention of "Body" and "Blood" of Christ because "...the words of Eucharistic Institution are indeed present in the Anaphora (Canon) of Addai and Mari, not in a coherent narrative way and ad litteram, but rather in a dispersed euchological way, that is, integrated in successive prayers of thanksgiving, praise and intercession." So without mentioning the Body and Blood of Christ, transubstantiation takes place because they are somehow "integrated" through prayers of thanksgiving, praise, and intercession. This nonsense is unheard of in all of Catholic theology prior to Vatican II. Is it any wonder Hunwicke thinks that any words can be sufficient for any sacrament? Anyone who believes (as Hunwicke must if he adheres to Bergoglio and his sect) that the Words of Consecration can be "integrated" in prayers where the words "body" and "blood" don't exist, will have no problem accepting any form for any sacrament. The Church teaches: "It is clear, if any substantial part of the sacramental form is suppressed, that the essential sense of the words is destroyed, and consequently the Sacrament is invalid." (See Aquinas, Summa III, Q. 60, Art. 8). "It is well known that to the church there belongs no right whatsoever to innovate anything on the substance of the Sacraments." (See Pope St. Pius X, Ex Quo Nono, 1910). "It [the Council] furthermore declares, that this power has ever been in the Church, that, in the dispensation of the Sacraments, their substance remaining untouched, it might ordain, or change, what things soever it might judge most expedient for the profit of those who receive, or for the veneration of the said Sacraments, according to the variety of circumstances, times, and places." (See Council of Trent, Session 21, Chapter 2; Emphasis mine). Furthermore, as the theologians teach, the form of a sacrament is that by which the matter receives its proximate sacramental determination. Hence, in the Eucharist, the bread and wine are the matter and the Words of Consecration signify the change into the Body and Blood of Christ. By consecrating the bread first and the wine second, the separation of the Precious Blood from Christ's Body is mystically re-presented in an unbloody manner perpetuating the one Sacrifice of Christ. (See, e.g., theologian Jone, Moral Theology, , pg. 307). The Church has been around almost 2,000 years, and has long since determined the essential components of the Sacraments; almost certainly within the lifetime of the Apostles. These essentials are part of Tradition and cannot be changed at will--not by any ecclesiastical authority including the pope or an Ecumenical Council--as the teaching above makes clear. The Sacraments of Baptism and the Eucharist were determined minutely ("in specie"), not simply in a general way ("in genere") to be more precisely determined by the Church as in the case with the other five Sacraments.. There is no one instance where any pope, theologian, canonist, or council of the Church has taught that the words "body" and "blood" were not part of the form. It was universally accepted and taught that any such form that omitted those words would be null and void. Ratzinger and Wojtyla dared to change that teaching in 2001. How can there be a problem of words being ambiguous when the men you recognize as "popes" teach that specific words set down by Christ Himself for the form of a Sacrament need not even be present? Mr. Hunwicke writes, It is argued that the phrase spiritus principalis is insufficiently precise because it is used in some dissident communities in the prayer which is said over a man who is already a bishop but is now being constituted a Patriarch. So ... are you, O ye sedevacantists, saying: "Originally this prayer, used for centuries to consecrate bishops, was adequate; but now, since some dissident communities began to use it for a different purpose, it has become insufficient, even in those communities where it is not used for blessing Patriarchs?" If so, I would regard this argument as absurdly and unconvincingly rococo. That's not the argument at all. The new Rite was several times defended by an appeal to forms in the Eastern Rites. However, those Rites use the term for the installation of a bishop as Patriarch, not as a sacramental form of Holy Orders. The same would hold for the Eastern Schismatics. I know I'm showing my age, but I couldn't help but think of that 1970s men's hair dye commercial, "Does he or doesn't he? Only his barber knows!" Does Mr. Hunwicke actually have such documents "up his sleeve"? Even if he does, the full text would have to be known to properly respond. So on lack of citation alone, his contentions could be easily dismissed. Nevertheless, as to..
(1) Was the same form used for installation of the pope as for consecration of a bishop? He got the Eastern Rite wrong, so no reason to think he got this correct either. (2) If It reads, "The fullness of Thy Mystery" instead of "ministry" it may very well be sufficient as it would read "Perfect in Thy priest the fullness of thy mystery and, clothing him in all the ornaments of spiritual glorification, sanctify him with the Heavenly anointing." It would be a case for the pope to decide, but it could refer to the fullness of the priesthood and the "mysteries" they confect--"the mystery of Faith"--and the ability to impart that power to new priests. The term "governing Spirit"in the new Rite could mean the grace of the Holy Ghost, but if so, where is the order of bishop? If it refers to the order of bishop, where is the grace of the Holy Ghost? The new form lacks at least one of the essential elements to be valid. (3) How could a priestly ordination read "Perfect in Thy priest..."if the man is not already a priest? Hunwicke makes no sense with his "possibly existing documents" up his proverbial sleeve. Whereas Mr. Hunwicke has all of his hypothetical documents up his sleeve, I have nothing to hide. According to theologian Tixeront, the oldest of episcopal consecration forms did use the very similar term "guiding Spirit." The term was employed to mean the grace of the Holy Ghost, not the office of bishop which is clearly signified later in the form! Although much longer than the new form of Vatican II, it is incredibly similar in words and tone, but it also adds that which is conspicuously absent in the Vatican II invalid form. "O God and father of Our Lord Jesus Christ, Father of mercies and God of all consolation, who dwellest in the heavens and considerest what lies below, who knowest all things before they happen: Thou, Who art the Author of ordinances of the Church by the word of Thy grace; who hast from the beginning predestined the just family of Abraham, appointing masters and priests, not permitting Thy sanctuary to be without a ministry; Who, since the creation of the world, delightest to be glorified in those whom Thou hast chosen; bestow now the power---which cometh from Thee---of the guiding Spirit Whom Thou didst give give to Thy beloved Son Jesus Christ, which He in turn communicated to the holy Apostles, who established the Church to take the place of Thy sanctuary, for the glory and unending praise of Thy Name. Thou Who knowest all hearts, give to this Thy servant, whom Thou hast chosen for the episcopate, to feed Thy holy flock, and to fulfill for Thee the offices of High Priest without reproach, serving Thee day and night; unceasingly to appear before Thee as an intercessor, and to offer Thee the gifts of Holy Church; and by the spirit of the sovereign priesthood, to have the power to forgive sins, according to Thy commandment, to bestow the ecclesiastical functions according to Thy order, to release from all bonds, according to the power which Thou hast given to the Apostles, and to please Thee in meekness and purity of heart, while offering to Thee an odor of sweetness; by Thy Son, Our Savior Jesus Christ, to Whom with Thee and the Holy Ghost be glory, power, and honor world without end. Amen." ( See Holy Orders and Ordination, B. Herder Book Co., , pgs. 151-152 and note 31 incorporated; Emphasis mine). Notice that the "guiding Spirit" refers to the grace of the Holy Ghost and the order of bishop is clearly expressed in the phrases "chosen for the episcopate" and "offices of High Priest." Theologian Tixeront places this form as originating in the third century! So much for hidden documents from antiquity whose very existence (let alone authenticity) and complete context is unknown. What Did Cardinal Gasparri Really Say? In any case, before 1947, the communis sententia [common teaching] among approved manualists (this is summed up by Cardinal Gasparri, 1852-1934, Secretary of State under Benedict XV and Pius XI) saw the Form for episcopal Consecration as being three quite different words: Accipe Spiritum Sanctum. Bishops, when consecrating a new bishop before 1947, intended to consecrate him when they opened their mouths and said these words, not when they uttered the words which Pius XII subsequently selected and declared to be the Form. "But the words which until recently were commonly held by Anglicans to constitute the proper form of priestly ordination namely, 'Receive the Holy Ghost,' certainly do not in the least definitely express the sacred Order of Priesthood (sacerdotium) or its grace and power, which is chiefly the power “of consecrating and of offering the true Body and Blood of the Lord” (Council of Trent, Sess. XXIII, de Sacr. Ord. , Canon 1) in that sacrifice which is no “bare commemoration of the sacrifice offered on the Cross” (Ibid, Sess XXII., de Sacrif. Missae, Canon 3)." (See Apostolicae Curae, 1896, para. #25; Emphasis mine). 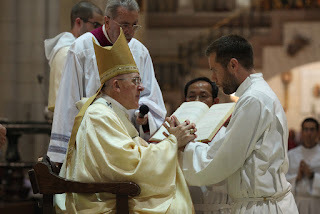 If "Receive the Holy Ghost" was insufficient to bestow the priesthood, are we to believe it is nevertheless valid in consecrating a bishop; one who receives the "fullness of the priesthood"? Mr. Hunwicke writes as if Traditionalists decide things on their own, when it is painfully apparent that while we use approved pre-Vatican II theology, he simply shows that he fails to understand many basics of that theology. Indefectibility and sedevacantism are not incompatible with each other. The Church has no power over the substance of the sacraments instituted by Christ. The form of a Sacrament cannot be made by using any words whatsoever. His defense of the new form for Episcopal Consecration is without merit; the form does not both signify the grace of the Holy Ghost and the specific order conferred-- as Pope Pius XII decreed it must. Indeed, one of the oldest forms clearly shows that "guiding Spirit"--used like "governing Spirit"--refers to the Holy Ghost and His grace. Later in that form the office of bishop is clearly and unambiguously expressed. When all things are examined, Hunwicke has proven only one thing: that his blog and Catholic theology are "Mutually Exclusive." I don't mean this as an insult, but "Fr." Hunwicke has hoodwinked himself. If he is going to question validity, why would he not question the governing spirit words used from his consecrated bishop in the Novus ordo. Mr. Hunwicke needs to be ordained a third time but before he does, he needs to study theology a little closer. I am so glad folks are starting to talk about NO ordinations. It is one of those elephants in the room that no one wants to mention. This issue simply raises doubts. And if there is doubt concerning validity of a sacrament, it should be avoided. The sustained attacks of Sedevacantists on the Pauline “ordinations “ is causing the V2 sect to try and defend the indefensible. They only come out vindicating our position! So did this man ever come out and say whether he had those documents or not? To say "Let's pretend I have proof of my position that would refute yours. What would you say?" must be one of the strangest arguing techniques I've ever heard. To the best of my knowledge and belief he has never produced his alleged “proof.” Now that he’s been called out on it, let’s see if he produces these documents! I read his articles several times (sort of a penance I suppose) and came away with the general premise of his defense of Pauline ordinations is that they were promulgated by Paul and therefore must be valid. There is no arguing with that manner of "logic." I am also reminded of the infamous quote by "Fr" Hesse who proclaimed his NO ordination valid because he could "feel" his priesthood. I do not know who his ordaining Bishop was, but again, how does one argue with that manner of "logic." This is typical Modernist “argumentation.” Unchanging theological principles are replaced by feelings. I “feel” like a priest. I will not deal with Sedevacantism. Paul must have been pope and his rite valid: it feels right. Is the chaos,misery,& violence happening within the socio-political-ecclesia realms since 1968,unseen since the fall of Rome,a sign the "New Rites" & "New Mass" are not from our Blessed Lord? Simultaneously,if Catholics lived near a Catholic church during these tragedies,they could attend the Holy Sacrifice of the Mass from certifiable valid clerics. I don't recall a time after the fall of pagan Rome when nearly every abomination known to Man was mainstream,encouraged,and legally exalted to protected status. June 18,1968 False Pope Paul VI invokes a "New Rite of Holy Orders." Jan 1,1973 Murder of Infants is made legal and protected by our Govt. In England this happened even earlier. Decade by decade it becomes worse & worse. Do you see where I'm going with my question? I wonder how they can be conferring valid sacraments and souls receiving Sanctifying Grace if our world and the former nuclear family be dissolving into personal moral social legislative chaos confusion violence and utter misery? Is this tangible or would it be laughed out of serious theological debate? If the crux of your argument is that the situation in our world makes sense given the diminution of valid clergy and Sacraments, I agree. Only secular humanists/ atheists and agnostics would laugh at the suggestion. “The fool hath said in his heart, There is no God. They are corrupt, they have done abominable works, there is none that doeth good.” (Psalm 14). I have thought the very same as you regarding the degradation of society and its correlation with NO ordinations! Yes sir,that's the basis of my belief. P.S. We should pray for John Hunwicke and the remaining 34 Valid Bishops within the Novus Ordo anti-church. If “words don’t matter”, why did the NO change them in the form to begin with?? Some Modernists were also Masons. Not all Modernists are Masons, but all Masons are Modernists! They wanted to invalidate the Sacraments. Other Modernists, non-Masons, wanted a more ecumenical “Church,” so things had to change and become more acceptable to Eastern Schismatics and Protestant heretics. Introibo, Exactly, they knew what they were doing by changing the wording. For them to assert “words don’t matter” is preposterous! If “words don’t matter”, they wouldn’t have changed the form. I agree with you. The masterminds behind the changes knew what they were doing and wanted to invalidate the Sacraments. There were other Modernists who were "useful idiots" for the Masonic infiltrators. In both cases Modernism and/or Masonry = the destruction of all things Catholic. Only Our Lord's promise keeps His Church going in this time of Great Apostasy. Introibo - in your response of February 12, 7:05 AM, you are too kind to "Eastern Orthodoxy". The followers of that are far more than schismatics because they also deny various Catholic dogmas. Therefore, they are heretics also. I use the term Eastern Schismatics as a common appellation, not as a precise theological definition. What seems apparent is that the changes in the new rite of episcopal consecration are not substantial. I would say that sedevacantists are mistaken in their understanding of what a pope and council can do and also in what the Church considers substantial change. If I'm mistaken, I'm up for correction. Please tell me how a "mass" that never uses the Words "body" and "blood" can confect the Eucharist. Name ONE approved theologian or canonist pre-Vatican II who taught such nonsense. We are then taught by the holy Evangelists, Matthew and Luke, and also by the Apostle, that the form consists of these words: This is my body; for it is written: Whilst they were at supper, Jesus took bread, and blessed it, and broke, and gave to his disciples, and said: Take and eat, This is My Body (Matt. 26:26; Mark 14:23; Luke 22:10; 1 Cor. 11:24). This form of consecration having been observed by Christ the Lord has been always used by the Catholic Church. The testimonies of the Fathers, the enumeration of which would be endless, and also the decree of the Council of Florence, which is well known and accessible to all, must here be omitted, especially as the knowledge which they convey may be obtained from these words of the Savior: Do this for a commemoration of Me (Luke 22:19). For what the Lord enjoined was not only what He had done, but also what He had said; and especially is this true, since the words were uttered not only to signify, but also to accomplish. That these words constitute the form is easily proved from reason also. The form is that which signifies what is accomplished in the Sacrament; but as the preceding words signify and declare what takes place in the Eucharist, that is, the conversion of the bread into the true Body of our Lord, it therefore follows that these very words constitute the form. In this sense may be understood the words of the Evangelist: He blessed; for they seem equivalent to this: Taking bread, He blessed it, saying: “This is My Body” (Matt. 26:26)...With regard to the consecration of the wine, which is the other element of this Sacrament, the priest, for the reason we have already assigned, ought of necessity to be well acquainted with, and well understand its form. We are then firmly to believe that it consists in the following words: This is the chalice of My Blood, of the new and eternal testament, the mystery of faith, which shall be shed for you and for many, to the remission of sins.10 Of these words, the greater part are taken from Scripture; but some have been preserved in the Church from apostolic tradition. Thus the words, this is the chalice, are found in St. Luke and in the Apostle (Luke 12:20; 1 Cor. 11:25); but the words that immediately follow, of My Blood, or my blood of the new testament, which shall be shed for you and for many to the remission of sins, are found partly in St. Luke and partly in St. Matthew (Luke 22:20; Matt. 26:28). But the words, eternal, and the mystery of faith, have been taught us by holy tradition, the interpreter and keeper of Catholic truth. Concerning this form no one can doubt, if he here also attend in what has been already said about the form used in the consecration of the bread. The form to be used (in the consecration) of this element evidently consists of those words which signify that the substance of the wine is changed into the Blood of our Lord. Since, therefore, the words already cited clearly declare this, it is plain that no other words constitute the form"
So please enlighten me with what is substantial change and what can a pope and council do? Please provide relevant citations pre-Vatican II. After all, if it's the same Church,what you're asserting must have always been true! Ok but I was specifically talking about Holy Orders. If the rite of ordination is invalid then the words of consecration don't matter much. From what I read, I think the sedes are making a mountain out of a mole hill with regard to the rite of episcopal consecration. I also think sedes make way too much of decrees that say such and such is irreformable. The Catholic Church has always been changing things. So the pope can incorrectly declare a "mass" as valid, but not the sacrament of Holy Orders? Think of what you've just de facto conceded: The Church can approve an invalid sacrament, which is an evil. But the Church cannot give that which is evil (dogma of Indefectibility). Therefore, Wojtyla could not have been pope. 1. Pope Pius XII (Sacramentum Ordinis) and Pope Leo XIII (Apostolicae Curae) authoritatively declared that the form of Holy Orders MUST contain reference to (a) the grace of the Holy Ghost AND (b) the Specific rank or grade of Order being bestowed (deacon, priest, or bishop). Both Apostolic Constitutions are considered of the highest degree of theological certitude; to the point that some theologians even declare them infallible insofar the pope in both cases was making a definitive judgement on an issue that must be held by all the faithful. (2) AS explained in my post, the new form for episcopal consecration is missing AT LEAST ONE of those necessary components. (3) Therefore, the new rite is invalid, or at least dubious at best. In the practical order, dubious Sacraments must be treated as invalid. It's a logical conclusion from which there is no escape. Do you think Jesus Christ can give us false sacraments? I mean, for what do we want the Church if She does not feed us?. This is similar to Frank´s assertion that all religions are equal and have the same rights. For Greater Glory of God, Long Life Christ the King and Our Lady of Guadalupe. Poni, Jesus cannot give false sacraments, but God can permit man to be be decieved by Satan's lies. V2 and the NO are Satan's biggest lie yet, and so many have fell for it. Yes Tom, i know. Mine was a rethorical question to any who follow the recognize´n´resist position. As the Church is the Spouse of Christ, none of them can give false sacraments. Rore Sanctifica provided a nice rebuttal but I dont know if it's accessible. This is the second reply to Hunwicke I've read, the first being from Novus Ordo Watch. Your response is just as technical but frankly more accessible and clear cut. Introibo -- you are certainly a heavyweight among lay sedes! Keep up the great work in fighting for Sacred Tradition and Holy Mother Church. Thank you my friend! Comments like yours keep me writing! In normal times, bishops with ordinary jurisdiction would be able to convoke an imperfect General Council and elect the pope. But today this scenario is absolutely impossible: there are no bishops with ordinary jurisdiction left! I can’t speak for Fr Desposito, but I don’t think Ordinary jurisdiction is necessary—he obviously does. There are other possible solutions such as sedeprivationism. Only time will tell. Have you done any posts on Guardian Angels, or do you know a good source to read about them? Thanks. I have not done any posts on the guardian angels (you’ve given me a god idea!). I recommend “The Angels in Catholic Yeaching and Tradtion” by Theologian Parente. A reprint is available through Amazon.com for less than $20. "1067. 3. At least during the so-called Western Schism (1378-1417), there were factions or schismatic sects, many of which yet belonged to the same Church of Christ. Therefore schism does not ipso facto separate from the Body of the Church. I respond. I deny the supposition, namely, that there was a schism separating from the Body of the Church. For during those disputes, in which all attempted to detect who in fact was the legitimate successor of St. Peter, so that all might give to him due obedience, there was not formal schism, that is, emanating from a spirit of secession, no indeed, neither was there material schism properly called, as we explain more in the Scholion to Thesis 31, nn. 1278-1283." Ok. What does the Great Western Schism have to do with my post? It falsifies your claim for prolonged vacancy. Hardly. Read Dorsch and remember that at the time no one knew who, if anyone, was pope. The citation you give in no way declares there cannot be a prolonged vacancy directly or indirectly. Theologian O’Reilly wrote directly after the Vatican Council Of 1870, when papal authority was defined. His work was considered among the finest in erudition. the point of the post was to show that using the western schism as evidence of prolonged vacancy is invalid. Thus, the basis of the argument for a prolonged vacancy used by O'Reilly is likewise invalid. Wrong. Your citation from Salaverri does not—indeed cannot—dispute the FACT that at the time of the Great Western Schism no one knew for sure who (if anyone) was pope. The Church was de facto without a pope. Second, Theologian Dorsch clearly teaches a prolonged vacancy of MANY YEARS. Theologian Berry speaks of a counter church set up by Satan that eclipses the True Church with a false pope and Sacraments. Finally, Theologian O’Reilly speaks to the reality that we cannot says what God is willing to permit to befall His Church and for how long. "Wrong. Your citation from Salaverri does not—indeed cannot—dispute the FACT that at the time of the Great Western Schism no one knew for sure who (if anyone) was pope. The Church was de facto without a pope." earth to stupid... go read what Fr. Salaverri wrote. I have. The passage you cite is On pgs.432 and 433. There was no formal Schism due to the lack of a desire to separate from the Church. Nowhere does it claim that at the time people didn’t know the identity of the true pope, therefore there was a de facto vacancy. You were not Schismatics but you might not be following the real pope. The fact of a prolonged vacancy of many years is expressly taught by Dorsch, and Salaverri in no way contradicts that. You pretend to be “Houston Control” when in fact, your reading of Salaverri is so bizarre, you must be “exploring strange, new worlds” where words take on different meanings then those used on Earth. In other words, Salaverri does NOT claim that during the Great Western Schism, people all knew who was the true pope. He does NOT claim there wasn’t massive confusion. Therefore, there was a de facto vacancy as no one could be sure which claimant—if any—was true pope. Why don´t you do an article on the Church teaching on migration? It Depends On What You Mean By The Word "Is"